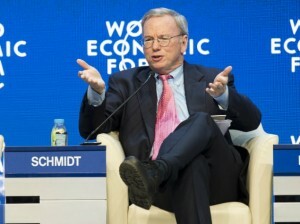 Eric Schmidt the executive chairman at Google said this week that he predicts the Internet, as we know it will end. When asked at the Davos, Switzerland World Economic Forum what he predicts about the future of the Internet, he simply answered that it would eventually disappear. Schmidt said there would be such a large number of IP addresses, so many electronics devices, sensors, wearables interacting things, that no one will even sense it. He added that it would be part of our presence always. Imagine he said you walk into a room, the room is dynamic and with permission, you grant you interact with things taking place inside the room. Schmidt concluded by saying a highly interactive, highly personalized and very interesting world is what emerges. The panel also featured Sheryl Sandberg the COO at Facebook along with others. Earlier during a discussion, Schmidt spoke about market dominance. Google’s search dominance is being looked at by the European Union in an antitrust case that is long running, and late in 2014, the European parliament called for Google to be broken up. When asked about a recent visit to North Korea, the Google chairman said the country has a number of Internet connections via data phones, but no roaming and usage of the web is highly supervised. Schmidt and Sandberg said the Internet was an important way of giving people a voice in the world. Currently it is estimated by Sandberg that only 40% of the world’s population has access to Internet. She added that with growth in access to Internet comes economic opportunity for all, and imagine the difference when 50% or even 60% of the world’s population has access to the net. Schmidt also said that the broadband can address issues of governance, personal issues, information needs, education issues and women empowerment needs. During another panel at the forum, Marissa Mayer the CEO at Yahoo and Mike Fries the CEO at Liberty Global spoke about the need to regulate the standards of privacy on the Internet.